Chief Justice Jorge Labarga talks about maintaining open lines of communication between branches of government. This year’s coverage of the 2017 Annual Florida Bar Convention kicks off with host Christine Bilbrey talking to keynote speaker Chief Justice Jorge Labarga about what’s included in his speech. The main topic is maintaining open lines of communication between branches of government. They also discuss extending term limits for supreme and appellate court judges and role of the Constitutional Revision Commission. Jorge Labarga is a Justice of the Florida Supreme Court, taking office on January 6, 2009. On June 30, 2014, he was sworn in as Florida’s 56th Chief Justice and the first Cuban-American to hold the post. Christine Bilbrey: Hello and welcome to The Florida Bar Podcast, brought to you by The Practice Resource Institute on Legal Talk Network. This is Christine Bilbrey, recording from the 2017 Annual Florida Bar Convention in Boca Raton, Florida. Thank you for joining us today. We have a very special guest this morning, joining me is the Chief Justice of the Florida Supreme Court, Justice Labarga. You have been on the Court since 1996, is that correct? Justice Jorge Labarga: I joined the Circuit, the trial court bench in 1996 and I joined the Florida Supreme Court in 2009, and then before that I was on the Fourth District Court of Appeals where I served for one day. Justice Jorge Labarga: One day. Christine Bilbrey: Is that a record? Justice Jorge Labarga: I think so. Christine Bilbrey: Excellent. That’s really impressive. We are talking to you Justice Labarga today, he is going to be doing the keynote speech tomorrow here at the Convention and we are curious to know what is the focus of your keynote? Justice Jorge Labarga: Well, the focus is going to be how things can get done when leaders of government talk to each other. For example, this year we just finished a legislative session not too long ago, and at the beginning of the session there were a number proposed bills that would have been really not very good for the Florida legislature. And the leadership of our branch, the judicial branch and the leadership and the legislature, the Speaker of the House, Richard Corcoran and the President of the Senate, Joe Negron, we started actually speaking to each other, and at the end the day all those bills pretty much were gone. They were resolved in ways that were satisfactory to both sides, and on top of that the judges got a 10% raise this year, something we had not gotten in the last 12 or 14 years. So I believe, firmly believe that the open lines of communication between the branches of government helped accomplish that. And then of course our lines of communication with the Governor’s Office and convincing him not to veto those raises and any other bills that were beneficial, that also obviously was instrumental. So I think that when we actually talk to each other, even though we might have differences in political views, there’s always a middle ground, there’s always a point where we can reach some type of agreement and get things done. So I think that’s important and I think this session is an important lesson for all government that we need to talk with each other and not talk at each other, but speak with each other and try and come to some kind of agreeable ground. Christine Bilbrey: And I am glad that you are working for that cooperation. Do you think that they are going to address term limits again for the judiciary? Will that come up again in future sessions? Justice Jorge Labarga: I am sure it will. The next session begins in January this year, so I am sure that it will show itself again, and I don’t know how much traction it will have. There are three ways it can be on the ballot. One, it can be an amendment proposed by the legislature and that was tried this last time, it did not make it, and that could happen, it could be brought back again this next session. The second way is the Constitution Revision Commission may place it on the ballot for people to consider. And the third way, it could be a citizen’s initiative. That would cause of a lot of money, but there are three ways in which the proposal for term limits for appellate judges could end up on the ballot for people to vote for. So I think until 2018 we are not going to know, it may still be showing its face over and over again. Christine Bilbrey: And I know that this has been proposed several times, is there any other state that you are aware of that has instituted term limits for the Supreme Court or the Appellate Courts? Justice Jorge Labarga: No, not that I know of. There may be one or two, I don’t know, but if there were any I think I would know. This would have been like a first in Florida. And Florida also has what we call constitutional senility, which meets the Constitution requires judges to retire at age 70, and there’s a movement to move that age limit to 75, because people are living much longer today and are staying healthier today. And I know many judges who had to retire, who could have gone on for another 10 years, and you are talking about someone who has been on the bench for a long time, who has got all this experience, and we really don’t want to lose them, but yet they have to go. And they will come back as senior judges and they are still doing just the same great job. So we are hoping that that’s also something that is going to be looked at. Christine Bilbrey: And I completely agree, because law is one of those professions that I know that here in Florida that we have attorneys that are actively practicing into their 90s, if you stay sharp and you are serving your clients, so absolutely, we would want the judges to remain on the bench. Justice Jorge Labarga: Absolutely. And again, that’s something that we hope that — it will have to be a constitutional amendment, because the Constitution requires judges to retire at age 70, so it will have to — the voters will have to vote on that. As you know in Florida, any change to the Constitution would require 60% approval by the voters, and that’s a pretty high number to reach. Christine Bilbrey: Right. And so I know that we are also going to have a Constitution Revision Commission, is it a seminar that’s going on, like are they just going to be addressing some of the things that have already been proposed for them, or do you know what they are going to cover? Justice Jorge Labarga: At this stage the Constitution Revision Commission, they are still working on the process and the procedures they are going to follow. They haven’t gotten down yet to what proposals they are going to actually consider to be on the ballot. So just so the listeners understand, every 20 years our Constitution requires that there be a revision or a Commission to look into changes to our Constitution so it can keep up with the times and the moment. So this year we had — it’s the 20th year since we had one, so we are having one this year. The way it works is there are 37 members on the Commission. Number one, the Attorney General is automatically appointed to the Commission. So Attorney General Bondi will be on the Commission. Then the Governor gets to make 15 appointments, 15, and he can select whoever he wants. Then the Speaker of the House gets to make nine appointments, and the President of the Senate gets to make nine appointments. And the Florida Judiciary, the Chief Justice gets to make three. That sounds fair, doesn’t it? Justice Jorge Labarga: Very balanced. So they have already chosen the three, and the CRC, the Commission is in place, and they have been meeting and what they are doing now is they are doing — they are holding like town hall type meetings, where they go from one place in the State of Florida to another, and have people — just citizens who wish to show up express their concerns about what should be or should not be on the Constitution. So they have been traveling around the state, and from what I hear they have been getting an earful from people about government in general and things that need to be changed and so on and on. So the Commission is in that stage right now where they are basically traveling around the state listening to citizens and their concerns. Once that stage ends, then they will actually have committees that are going to look into different areas of the Constitution that they feel may need changes, and that’s when we are going to start seeing what amendments may be proposed to be on the ballot. So all they do is the Commission can decide, I believe by 60% of the vote, of the Commission what could go on the ballot. And once an amendment, a constitutional amendment or revision to the Constitution goes on the ballot, then the voters in the election of 2018, in November will decide by 60% of the votes whether it should go on there or not. So they have to sell it to the voters, that 60%. Christine Bilbrey: And so because it happens every 20 years, I know there has been discussion about just establishing the rules. Are they supposed to — is there a precedent for the rules or do they get to make them up every 20 years? Justice Jorge Labarga: Well, there is precedent for the rules. We did this 20 years ago and then 20 years before that and 20 years before that, so there are rules in place, but again, 20 years is a long time, things change. So I am sure that some of those rules need to be updated to today’s standards or whatever. So I am sure the Commission will look into that and they will decide what the rules will be that they will follow. Christine Bilbrey: And I recently met the General Counsel for the CRC who had been Governor Scott’s General Counsel. What is his role in this? Is he just advising them on the constitutionality of the proposals? Justice Jorge Labarga: I would think he would be the one they would turn to, to see whether anything they are proposing is constitutional. I would think he is the go-to person for that. Just like when he was General Counsel to the Governor, the Governor would go to him to see whether anything he wanted to do would meet constitutional standards. So it’s the same thing. He is like a lawyer for the Commission, and I know him very well, a very nice guy, and he is doing a great job. Christine Bilbrey: Good. Good. Well, I can talk to you about this all day, but I know that you have — you want a little rest before you get to your keynote tomorrow, but tell our listeners, if they want to come see you at the keynote, where you are going to be located, what time that is happening tomorrow? Justice Jorge Labarga: Well, it will be the Judicial Luncheon that we have every year, where all judges are invited. And it will be here at the Boca Raton Hotel in — I think it’s their Main Hall. It will be at 12 noon. And it’s usually packed. Christine Bilbrey: I can imagine. Justice Jorge Labarga: It’s usually packed and it’s — it’s one of the features for this convention. So I am looking forward to that and I invite anyone who wishes to come and listen, not just to me obviously, there will be other speakers as well. And it’s usually well attended, a lot of judges, especially locally, like the Convention this year is being held here in Boca Raton, so you can bet that many of the Palm Beach County Bar — the Palm Beach County Judiciary will be here, because they can travel, and usually we have it every other year in Orlando. So usually in Orlando, the Ninth Circuit, that judiciary turns out. But I think a lot of appellate judges are here. I know the entire Supreme Court is here. Justice Jorge Labarga: And so we usually have a lot of fun while we are here. We get to meet the lawyers. I did book us really solid. Like the Convention starts today, but I have actually been here since Monday. We had a retreat that I scheduled for yesterday to deal with the future of the bar. So we had a whole bunch of lawyers and judges from around the state and we talked about the future of the bar and that kind of thing, to prepare for that. So that was all day yesterday. And then tomorrow I will be booked from 9 o’clock in the morning until 10 o’clock at night, going to the Historical Society meetings, going to the Judicial Luncheon, and then judging the Supreme Court judges, the final Moot Court Competition for law schools, and that’s always a lot of fun. Then after that, we have a question and answer period where the Supreme Court answers questions for the bar and that usually is well attended, and some really good questions are asked. And then after that we have of course The Florida Bar Foundation Dinner, where we all attend that every year. And after that, if I am still standing, I would go to a few receptions they may have around the place. Christine Bilbrey: Yeah. They are getting their money’s worth from you. Justice Jorge Labarga: They are. And this has been another edition of The Florida Bar Podcast, brought to you by Practice Resource Institute on Legal Talk Network. I want to thank Justice Labarga for joining us. If you liked what you heard today, please find and rate us in iTunes. I am Christine Bilbrey, until next time, thank you for listening. 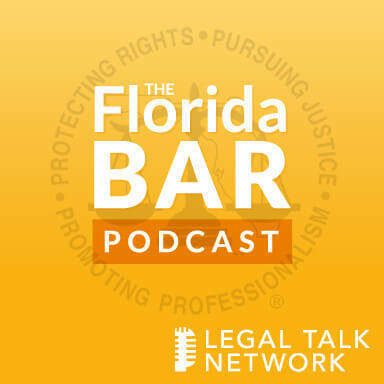 Outro: Thanks for listening to The Florida Bar Podcast, brought to you by The Florida Bar’s Practice Resource Institute and produced by the broadcast professionals at Legal Talk Network. If you would like more information about today’s show, please visit HYPERLINK “http://www.legaltalknetwork.com” legaltalknetwork.com. Subscribe via iTunes and RSS. Find The Florida Bar, The Florida Bar Practice Research Institute and Legal Talk Network on Twitter, Facebook and LinkedIn, or download the free app from Legal Talk Network in Google Play and iTunes.